The Institute for Continuing Education is: The institution that is tasked with preparing national / international certified training programs in accordance with the competencies needed / arranged by each study program.The certification is needed by prospective graduates to be included in the SKPI (Certificate of Accompanying Diploma) as mandated by Permendikbud No. 81 of 2014 Article 14. Distance Learning and Education and Training. 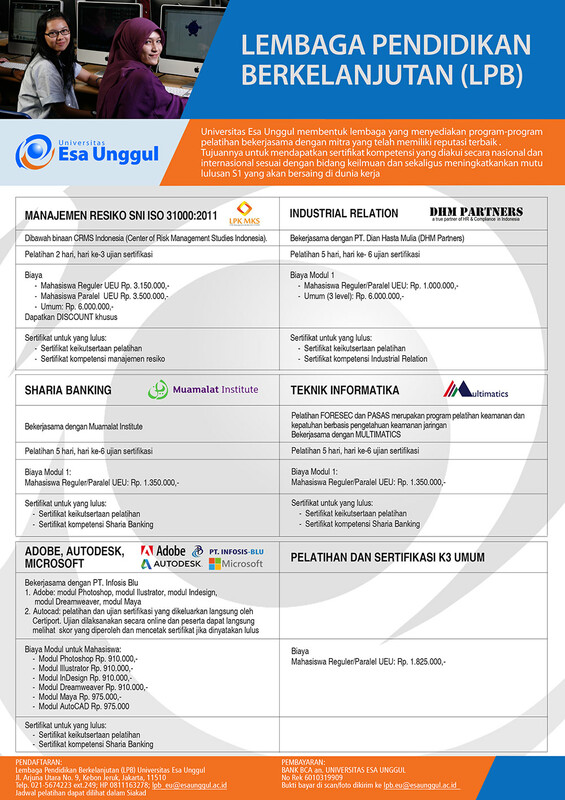 Especially for Product Design and Communication Science study program. In house training with specific topics and topics that have been provided by LPB and training on Esa Unggul campus. CERC (Certified in Enterprise Risk Governance) which is a professional certification designed for professionals and practitioners with a minimum of 15 years of experience, where the experience of the last 3 years is at the senior management level, and / or the supervisory body, and / or other equivalent roles.